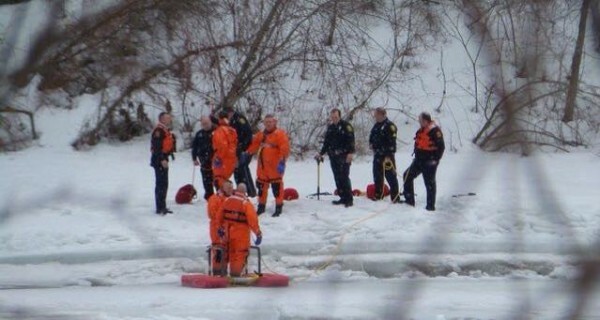 Police, fire and rescue personnel are seen Saturday at the Kennebec River in Augusta. AUGUSTA, Maine — Police have asked the public to help identify the person who Saturday afternoon went through the ice on the Kennebec River. Augusta police posted information Sunday morning about the incident and effort to recover the body of what officials believe is a female. Dispatchers received at about 1 p.m. Saturday several reports of a person standing on the ice on the river just north of the Calumet Bridge near 1 Cony St., Deputy Chief Jared Mills said in the Facebook posting. The Maine Warden Service and the Maine Marine Patrol joined the rescue effort but because the Kennebec River is completely frozen south of the Calumet Bridge, the conditions made it impossible locate the person, Mills said. “The Maine Warden Service and marine patrol will work to recover the individual from the Kennebec River once the treacherous conditions on the river subside,” Mills said. If anyone has any information about this incident or knows the identity of the person in question we ask that they contact Officer Paul Doody of the Augusta Police Department at 626-2370.